There isn't a lot to update. 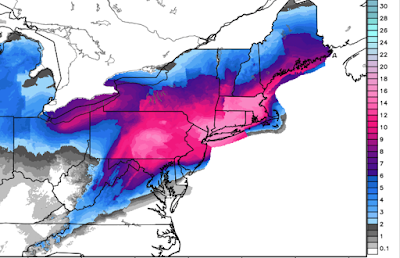 I'm not focusing a lot on exact snow amounts because they are so hard to measure when winds are gusting to 50 mph as they will from NYC to Boston and, perhaps, into Maine. Regardless, here is a rough estimate of snow accumulations. Blizzard conditions are likely but the storm will not begin until Monday afternoon in Washington, and about 8pm Monday evening in NYC and Hartford. Should begin by around 10pm in Boston. If you can fly in (I don't know why you would want to) before that time, you should make it. However, if you have plans to fly out tomorrow evening you can pretty much forget it. The airlines are already cancelling flights. I would not try to fly in or out on Tuesday. This creates the problem of stranded travelers. I have my Airline Crisis Survival Guide here. I recommend you read it and start acting on it now.